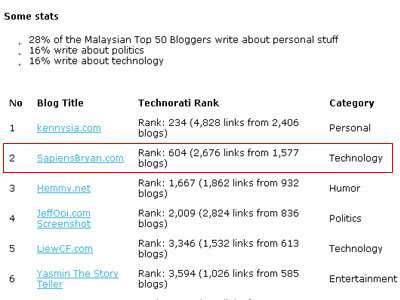 #2 Most Influential Blog In Malaysia? Now I’m back (again!) to blogging because I was a bit amazed this morning been told that this blog is labeled #2 most influential blog in Malaysia. Basically, the way Gaman ranked the blogs is based on Technorati ranking. This blog is ranked 604 in Technorati at the moment. Therefore, after reading his post I don’t feel surprise this blog ranked so high in Gaman’s chart as long as only Technorati ranking is taken into account. Is my blog influential? I suppose many of you doubt about it, me too. Anyway, this is Gaman’s chart and he has his own explanation to how he defines “influential”. Anyway, one thing I’m sure is that this chart will be a good foundation for any future research on Malaysian blogs. This post is also a friendly plug in a way to appreciate the effort and time Gaman (owner of Sabahan.com) has put in to compile the list of the top 50. Kudos to him! You nice host. That’s why ranking so high. LOL! So, ‘influential man’, just know about you today from Sabahan.com (referred to by Rocky’s Bru). I hope to read more funny and tech thingy from you. My friend’s blog sits at #15 in Alexa’s ranking although I am certain his site hardly receives any traffic. Che-Cheh: I guess not very interesting for some tech savvy people loh. Anyway thanks! Hey there you are right, it’s important for such work to be done for the purpose of research on blogging in the future. I’m currently doing some research on blogs and blogging myself. Gambate!